Four hours including certification exam. For those with strong keelboat skills but no formal certification. Challenge requirements meet the ASA Basic Keelboat Certification standards. Contact us to check course availability and to schedule your course. Formal small keelboat training or equivalent experience. The ASA Certification fee is $85. 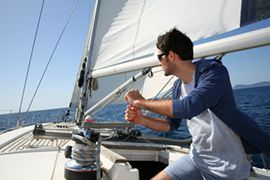 Visit our Basic Keelboat Certification Overview to review your knowledge to successfully complete the challenge.